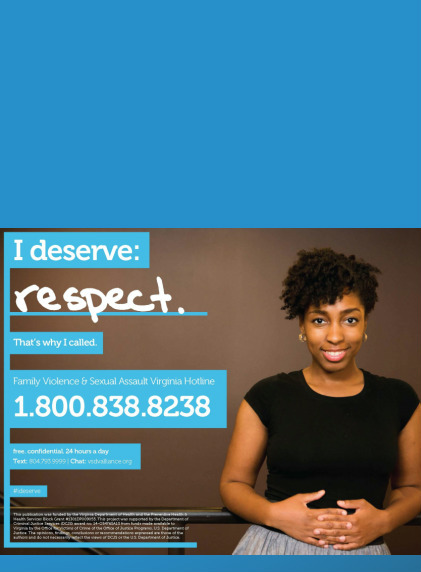 The #ideserve campaign is designed to reach young, African-American women, ages 18-24, and to encourage women who are experiencing violence in their lives to call the statewide Virginia Family Violence & Sexual Assault Hotline for help. The #ideserve campaign emphasizes essential elements of healthy relationships and features young women proclaiming that they deserve the following essential elements in their relationships: support, respect, safety, and being heard. The Action Alliance began testing the #ideserve campaign strategies in Metro Richmond in April 2015. Campaign strategies include: distributing packages of posters, pens, magnets, stickers and other marketing materials to targeted groups in Richmond (e.g. churches, clubs, community centers, and college campuses), placing exterior and interior ads on Richmond public transportation, and gathering data to determine effective social media strategies. The statewide Virginia Family Violence and Sexual Assault Hotline offers confidential support by trained professionals to survivors, friends, family, and helping professionals. The Hotline may be contacted by phone, chat or text. 1 Virginia Office of the Chief Medical Examiner. (2014). Family and intimate partner homicide: A descriptive analysis of the characteristics and circumstances surrounding family and intimate partner homicide in Virginia, 2013. Richmond, VA: Virginia Department of Health. Retrieved 4/13/15 from www.vdh.virginia.gov/medExam/fipvhs-reportspublications.htm.